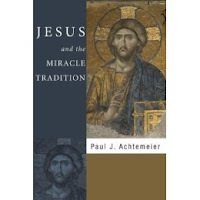 Achtemeir, Paul J. Jesus and the Miracle Tradition. Eugene, OR: Cascade, 2008. Pp. 255. Jesus and the Miracle Tradition, one of P.J. Achtemeier’s latest books is a great contribution to the field of biblical studies. The book, nearly 220 pages in length, is a fresh and timely piece of exegetical work. The point of the book, according to Achtemeier is not to question whether Jesus really performed the miracles, how they happened or whether Jesus was a magician of sorts. Instead, Achtemeier presupposes that they happened and that Jesus did them; this allows him to move past old disputes and on to another, and perhaps, more important issue/queestion: What did the miracles mean? Of course, when asking what the miracles meant, one is really asking how the Gospel writers made them mean, interpreted and understood them or what meaning they infused them with. While I find the whole “community” behind the text approach lacking to a good degree and while I am not convinced that there were miracle “traditions” as such, there is a lot of good to be gleaned from this book. For example, the decision to pursue the meaning of the miracles is priceless. For too long, post-Enlightened readers of the Bible have tried to analyze the scientific aspects of the miracles (e.g. whether they could have happened or not, how they happened, etc.) at the cost of understanding them from literary and theological points of view. Of course, the whole “let’s just accept them and move on” attitude can be problematic at certain junctures, but it does have its strong points. Exegetically, I must say that I was unconvinced by Achtemeier’s conclusion regarding the “Son of David” passages in Mark’s Gospel. I have answered some of his critiques and offered my own response to that, which you can read by clicking the following link: Was Jesus Both Lord and Son of David? I did find the discussion on the “Son of Man” passages valuable as well as the probing of the relationship between miracles and discipleship in Mark. Again, I was less impressed or convinced with the sort of redactional, source-critical approach but then again, I’ve never really been big on those methods anyway. At the end of the day, I would recommend this book to new and seasoned readers alike. Achetemeir, as usual, does great research, impressive exegesis, raises many questions and paves new avenues for research with this timely work. Thanks for the review copy Cascade!